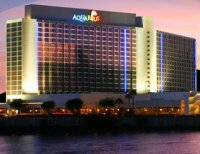 Aquarius Casino Resort in Laughlin, Nevada has a 57,000 square foot casino gambling floor with 1,250 slot machines, 45 table games, race and sport book, poker and hotel. Sportsbook: State-of-the-art Race and Sport Book is the place you can bet and watch your favorite race or game. The Aquarius has two 18-story high hotel towers with luxurious rooms with unsurpassed appointments and excellent service.